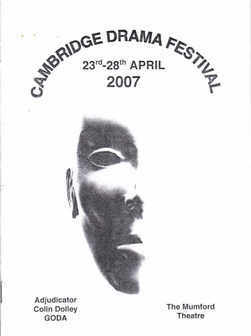 "A Separate Peace" was the CADS submission to the 2007 Cambridge Drama Festival, where it won 1st Prize as well as the Audience Appreciation Award. Amy Marks won the award for Best Cameo Performance. The play was previewed at Foxton as part of a double bill with Foxton Vixens' entry to the same festival, "Semblance of Madness" by John H Newmeir. The role of Doctor was taken at Foxton by the director. It was subsequently performed in Royston as part of a double bill together with the group's entry that year for the Haverhill Drama Festival, "The Allotment".